A spectacular display of Earth's southern auroras wascaptured on camera by astronauts on the International Space Station during arecent solar storm. Auroras — ever-shifting displays of colored ribbons,curtains, rays, and spots — are most visible near the north (auroraborealis) and south (aurora australis) poles as charged particles (called ions)streaming from the sun (the solar wind) interact with Earth's magnetic field. 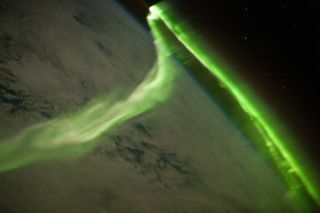 Astronauts caught this image of an aurora during a geomagneticstorm that was most likely caused by a coronal mass ejection from the sunon May 24, 2010. The space station was sailing over the Southern Indian Oceanat an altitude of 220 miles (354 km) when this photo was taken by an astronautmost likely looking towards Antarctica (not visible) and the South Pole. The curvature of the Earth's horizon (the limb) is clearlyvisible, as is the faint blue line of the upperatmosphere directly above it (at image top center). Several stars appear asbright pinpoints against the blackness of space at image top right. Auroras occur when ions in the solar wind collide with atomsof oxygen and nitrogen in the upper atmosphere. The atoms are excited by thesecollisions, and they typically emit light as they return to their originalenergy level. The light creates the aurora that we see. The most commonly observed color of aurora is green, causedby light emitted by excited oxygen atoms.